Over the last day, Russia-backed militants delivered four precision attacks on Ukrainian troops’ positions in eastern Ukraine. “The ceasefire at the contact line had held for one day. Yesterday, in the first hours of the day Russia-backed militants mortared Ukrainian troops’ positions,” reported Ukrainian Ministry of Defense spokesman on ATO Dmytro Hutsulyak at a press briefing at Ukraine Crisis Media Center. In Luhansk sector, Russian proxies opened fire twice. Starting from 13:40 militants delivered an hour-long attacking attack near Luhanske using mounted grenade launchers, heavy machine guns, and small arms. Militants made another attack using automatic grenade launchers and small arms in Stanytsia Luhanska area in the evening. In Donetsk sector, Russian proxies shelled Lebedynske and Vodiane with 82-mm mortars after midnight and used small arms in the former. Militants fired a total of fourteen 82-mm rounds. 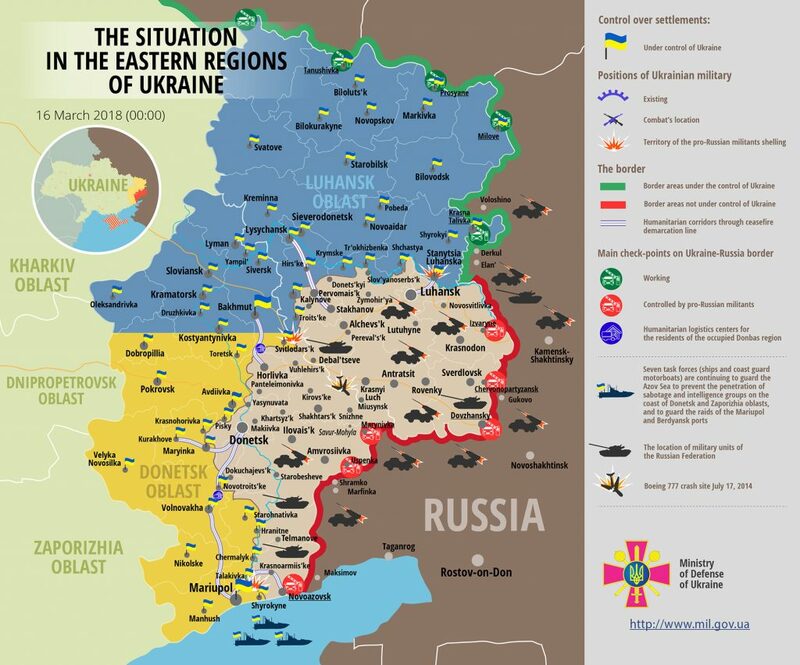 Ukrainian troops did not return fire and incurred no losses over the last day. Report on the military developments as of March 15 is available here. Interactive data on the shelling: chronology shelling chart and the interactive map.